Let me tell you right from the start I am scared of stir frying!!! I want my Chinese food to taste like it does when I eat at my favorite restaurant and does it??? Not usually. This recipe is different. Why you ask?? Well because it is not like your usual sweet and sour. Not battered and not deep fried. This is really rather healthy. This recipe comes from one of my favorite magazines. I have NEVER HAD A RECIPE FAIL from EVERYDAY FOOD!! For real! You must give this one a try! I changed a few things here and there so my children would like it without picking out what they don't like. I do not like it when they pick. I will give the recipe exact and note my changes. This is "what's cookin" tonight on Beaty's Creek. In a bowl combine pineapple juice, vinegar, soy sauce, cornstarch, brown sugar, and 1/4 cup of water. Season with salt and pepper. This will be your sauce. You will add this last. In a large skillet or wok(I used a wok) coat with oil. Place pork in 2 batches and stir quickly. Brown on all sides and remove. Pork will finish cooking once it is added back to skillet or wok. 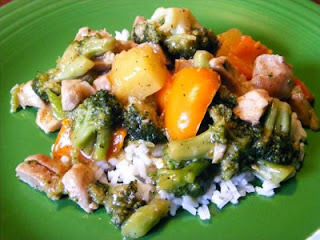 To skillet or wok add onions, broccoli, and bell peppers. Season with salt and pepper to taste. Cook stirring until peppers are crisp tender. This should happen in 6- 8 minutes. Add pork and any juice to veggie mixture. At this time add pineapple and whisked sauce. Simmer until all is warm and sauce is the consistency you want. Serve with rice.